Doing some shopping? Were you aware that CGGBC has an Amazon Smile account? 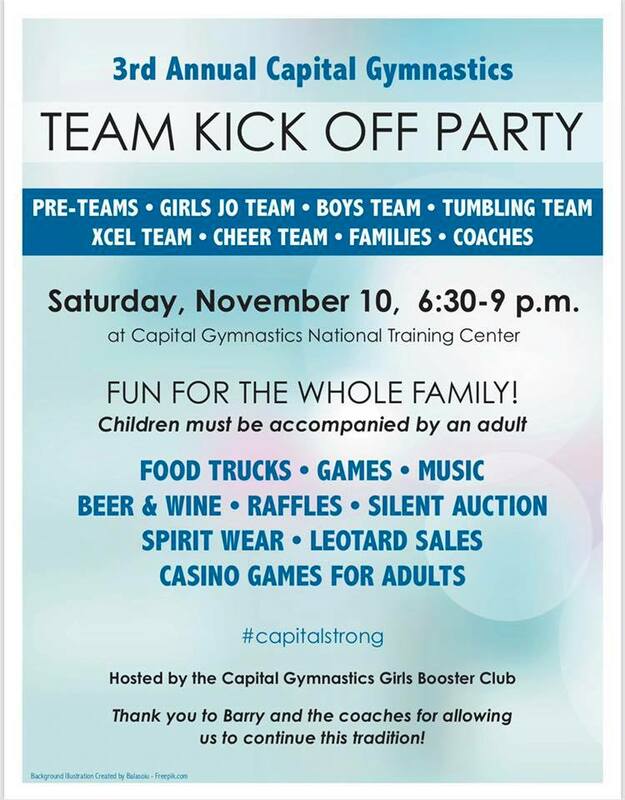 Just search "Capital Gymnastics Girls Booster Club Inc" and .5% of your purchases will go towards CGGBC. Easy peazy! 2018 Annual Capital Kickoff Party! ​We are starting off our 2018-2019 season with our annual Kickoff Party! Please come out and join us for some fun events. This year we are going to have some of the great activities we've had in the past (Lazer Tag, Knockerball, raffles, etc.) plus some NEW and exciting activities for both kids and adults (Henna Painting and CASINO tables). You don't want to miss this event! * Please note: This is not a drop-off event. Parents must accompany their child. Waiver form - Parents: Please complete, sign, and bring with you for your child to participate in the Knocker Ball game! Don't want to wait in line? This year you can pre-purchase tickets online! Keep scrolling! Single tickets will still be available for sale on-site! ***NOTE: All orders placed (with the exception of the custom leo & shorts) are to be PICKED UP the night of Kickoff (items will not be shipped). ​CGGBC Capital Strong Leotard & Shorts! ​Stay tuned for delivery dates!